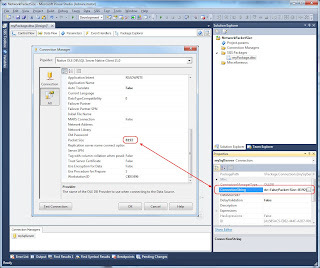 If your SSIS package gets its data from a SQL Server database located on an other machine, then the data of your query will go from the SQL Server machine over the network to your SSIS machine. This is done in small network packets with a default size of 4096 bytes (4 kilobytes). The Data Flow Task uses buffers to transport multiple rows of data through the data flow. Its default size is 10485760 bytes (10 megabytes). 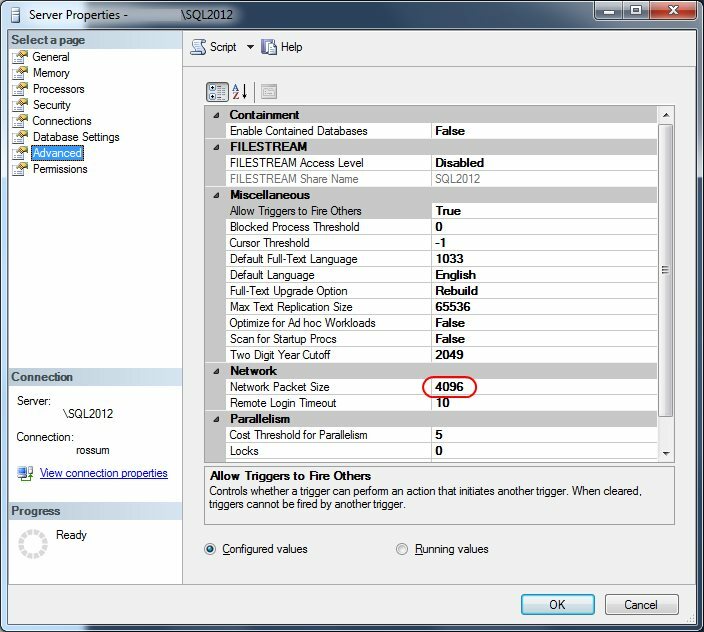 This means you need 2560 network packets (10485760 / 4096) to fill one buffer. By increasing the size of the packets you need less packets to fill that buffer. With the maximum size of 32768 bytes (32 kilobytes) you only need 320 network packets (10485760 / 32768) to fill one buffer. This could, depending on the quality of your network, improve the performance significant (For poor performing networks you need to resend a lot of packets, making large packets inefficient). You can adjust the default size of 4096 bytes within SQL Server. However I strongly recommend not to change that in SQL Server. 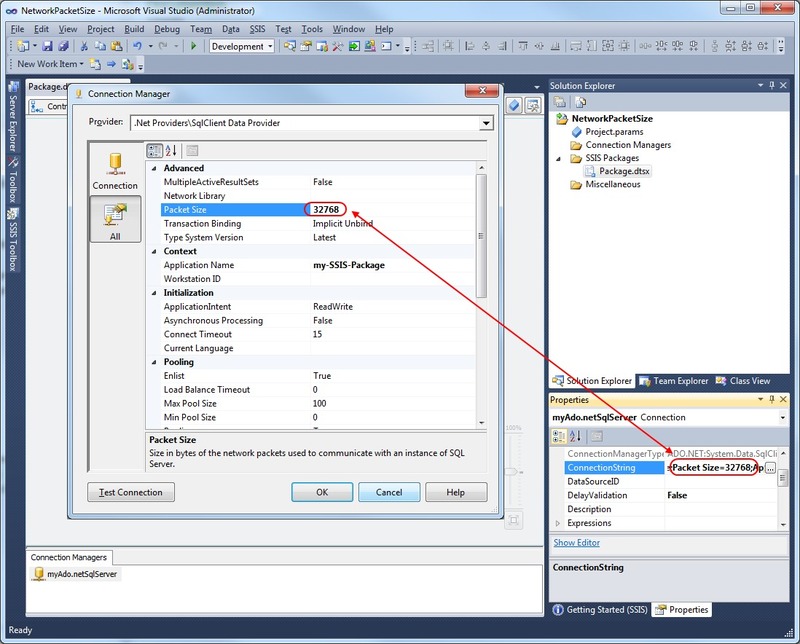 You should add the network packet size to the connectionstring to override this default value. 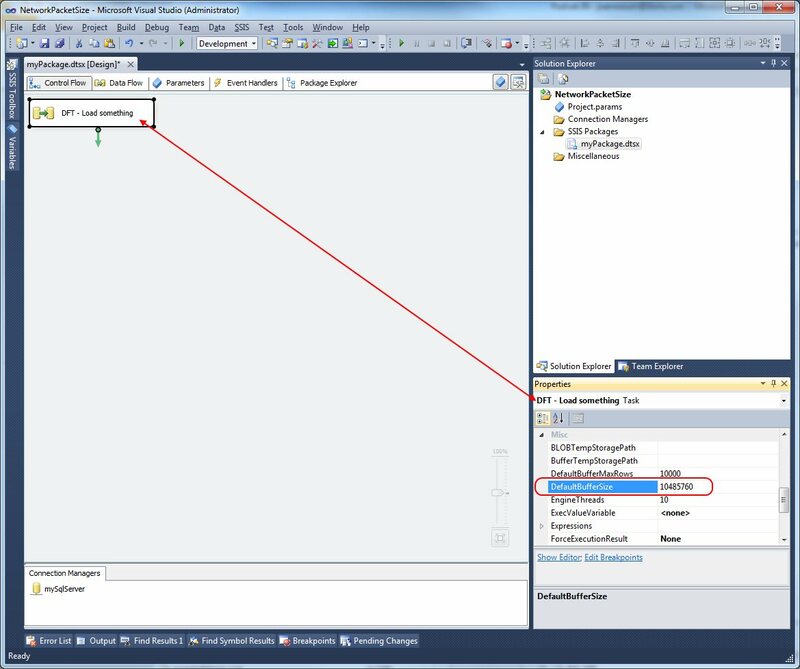 Within SSIS you can change this value in the OLE DB Connection Manager or directly in the Connectionstring property. The maximum value for the network packet size is 32768 bytes, but the property is zero-based, so the max number is 32767. 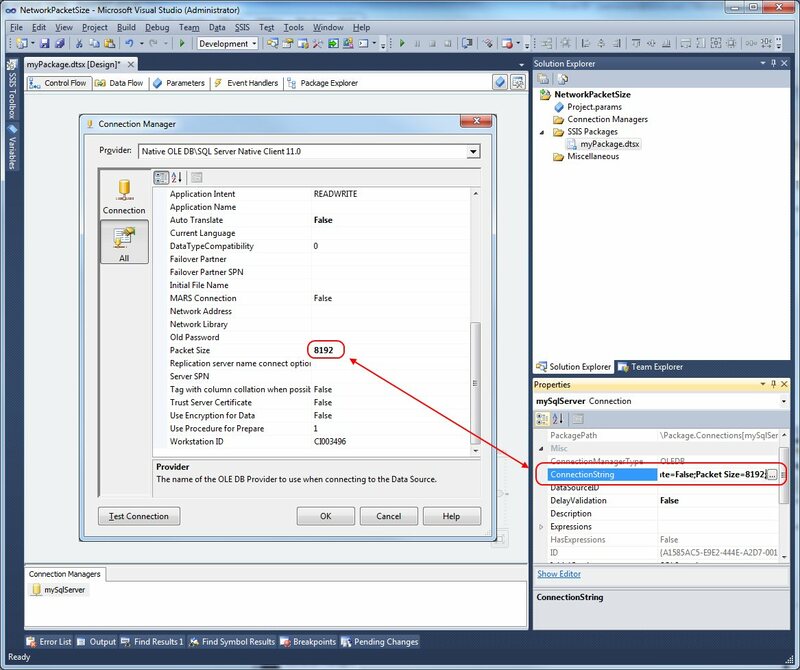 The value 0 means use the SQL Server default. 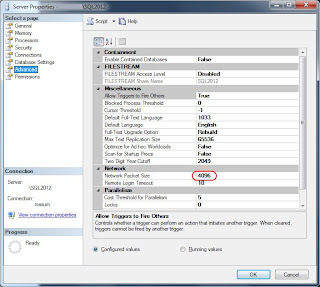 The ADO.Net Connection Manager has a default of 8000 bytes. this one isn't zero-based, so its max value is 32768. Note 1: if you are using package configurations on the connectionstring property then don't forget to add this value to the connectionstring in your config table/file. Note 2: you could enable jumbo frames on your network to increase performance even more, but you should consult a network specialist for that.